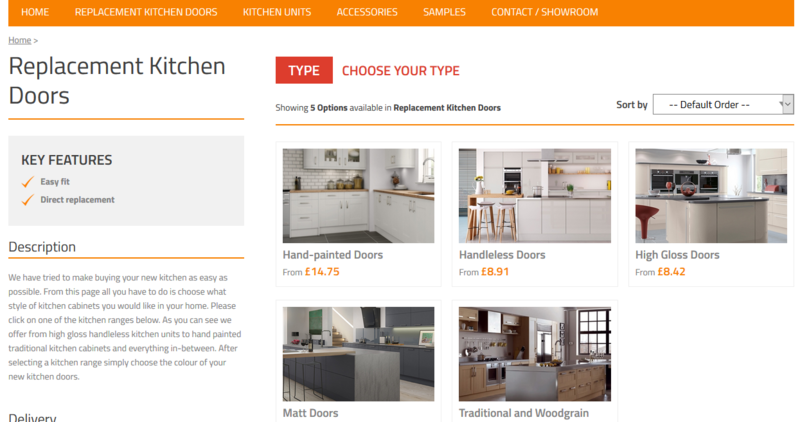 If you’re a regular visitor to Hot Doors, you may have noticed that we recently launched a completely revamped version of our website! We’re very excited to be moving forward with the upgraded version of our online store, which makes it even easier for you to find what you need and place an order with no hassle. 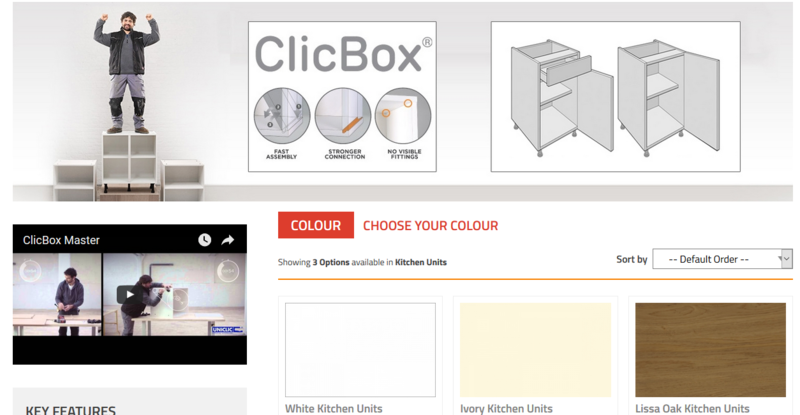 Starting from our homepage, you’ll immediately find plenty of inspiration for any kitchen revamp you may be planning, as we always feature some of our most popular and affordable products prominently. From here you can easily see where to go when you’re ready to move onto the exact product section you need. You can also learn more about what makes us unique at Hot Doors, and even read some of our brilliant reviews from Trustpilot, where we’ve earned a score of 9.5 so far! Next, we move onto our top product range, replacement kitchen doors. Here you’ll find a selection of doors for ultra-modern handless kitchen cabinets, as well as high gloss, matt finish and hand-painted options. We also stock a great range of real wood kitchen doors and traditional designs to suit a classic kitchen style. Whatever look you want for your units, we have a cost-effective solution. Since we mentioned kitchen units, let’s make that section the next stop on our tour. 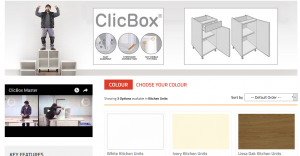 Our brilliant ClicBox units are amazingly quick and easy to assemble, plus they’re available in a choice of three colours. These make for ideal base units if you’re going one step further with your kitchen renovation and replacing some or all of your units. 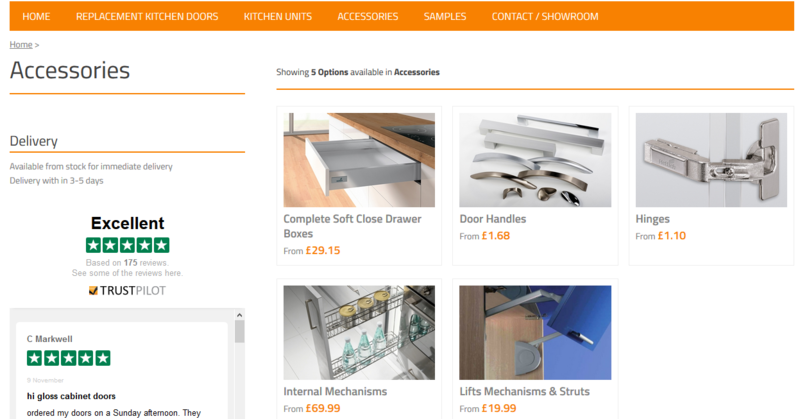 Next up is our accessories section, where we supply all the extra items you need to fully install your kitchen units and doors. These include internal mechanisms such as soft close drawer boxes, hinges, lifting mechanisms, and of course a wide selection of door handles. If you like what you’ve seen so far, you can find out more from us before placing your order. We offer samples for our entire replacement kitchen door range, starting from only £8.99 including postage, so you can see exactly how high quality our products are before committing. Alternatively, you can see our massive range in person by visiting our showroom, where we can also provide quotes for custom-made or custom-painted kitchen doors. To discuss anything with us, you can also contact us here. 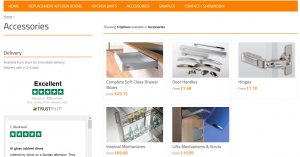 We hope you enjoying browsing our website and find everything you were looking for!